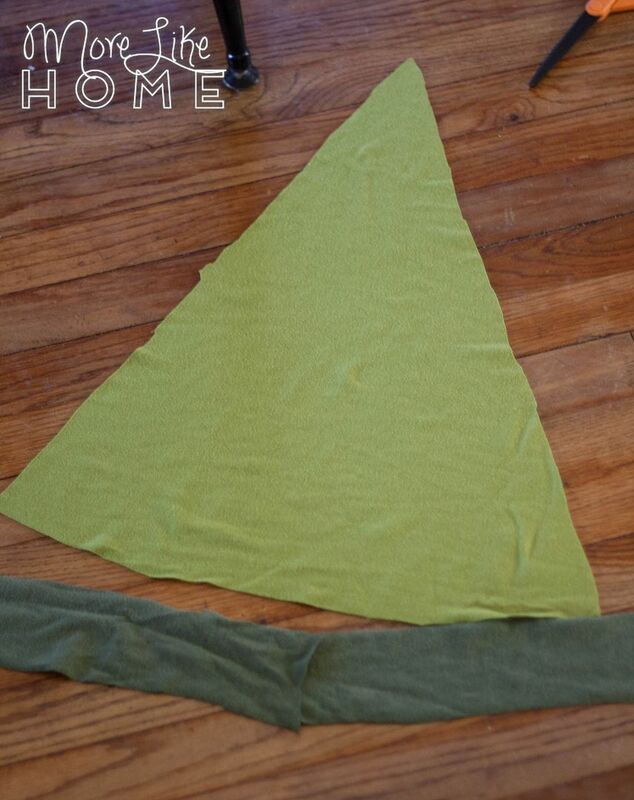 To make the top, I folded a piece of light green knit fabric in half and laid one of his shirts on top to to use as a pattern. I cut the costume a couple inches larger so he'll be able to use it for a few years, and cut the sleeves to be a tank-style top. 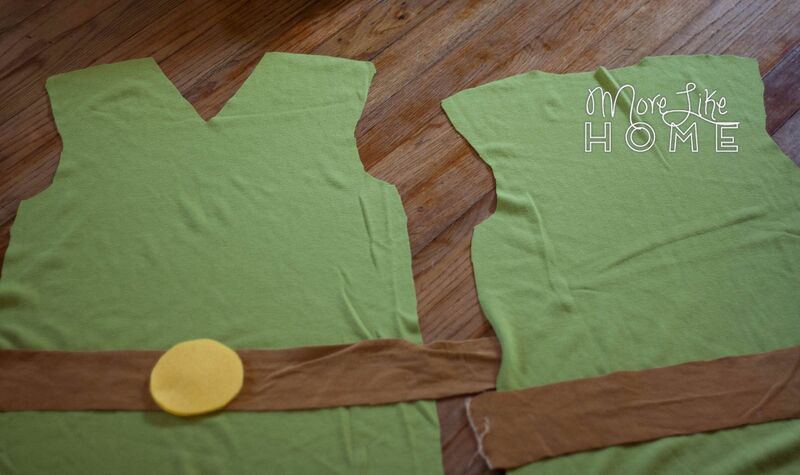 I also cut it several inches longer than his t-shirt (since Toon Link's shirt is a little long) but... it might be a little too long. Oops. I'd go a little shorter than this next time. 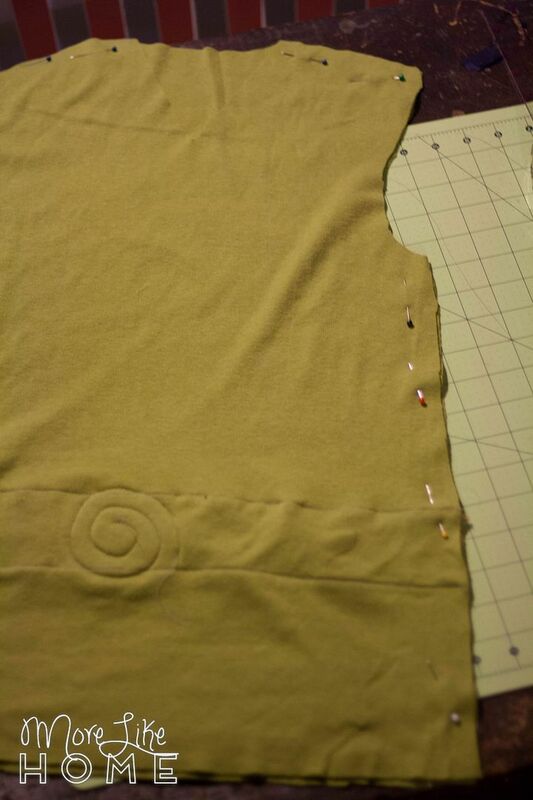 Use the first piece as a pattern to cut a second piece for the back. On the front piece I cut the neck down a little more into a V. Then I laid a belt section on top of each shirt piece and lined them up at the same height. Cut strips of brown about 3" wide. If it's a woven fabric (I made the belt with left over brown corduroy), fold the raw edges under about 1/4" and press them to keep them in place. 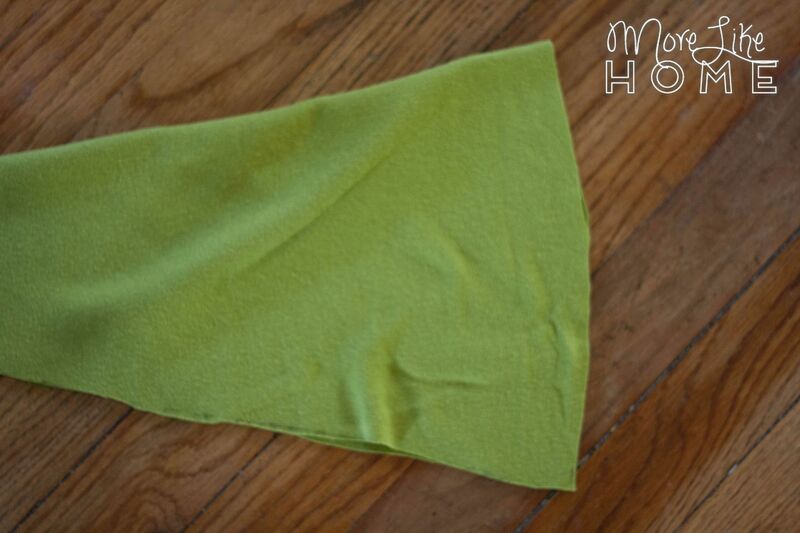 If it's a knit, you don't need to worry about fraying and can just set it in place without folding the edges under. 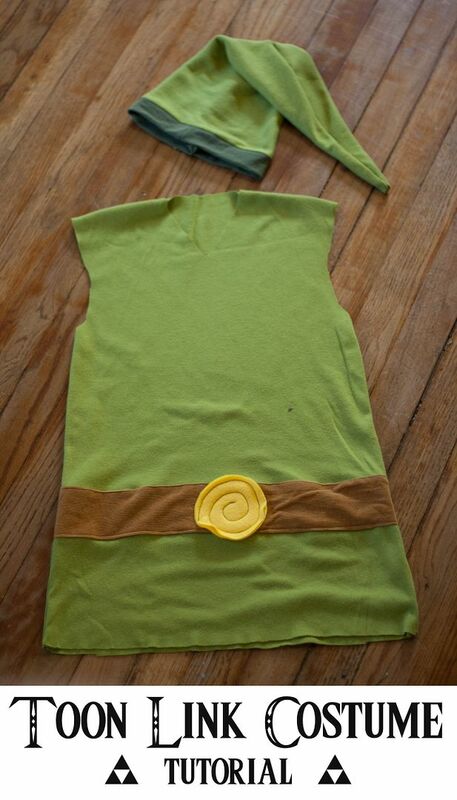 Then I sewed along the top & bottom of each belt piece and cut off any extra at each end. 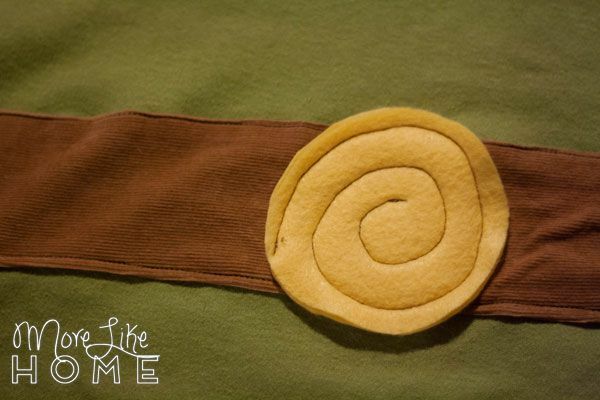 I put a yellow felt circle in the center of the belt on the shirt front and stitched it on with a swirly pattern. Then all that was left if putting the two body pieces together. 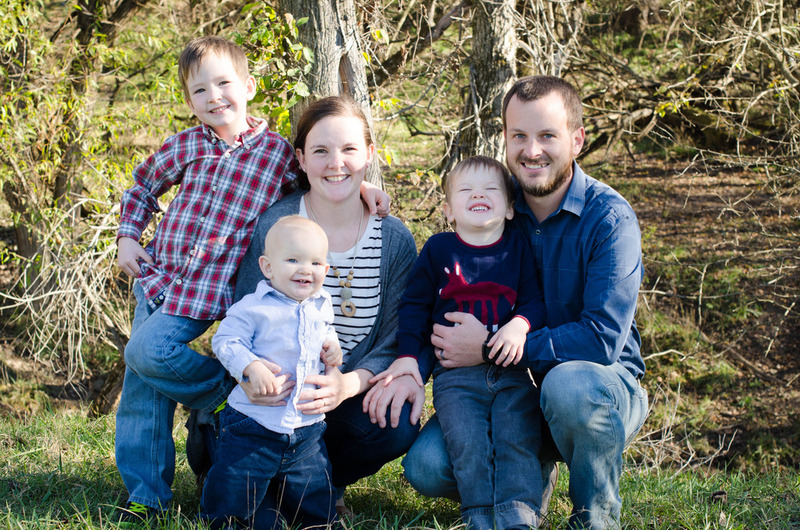 I laid them right side together and pinned across the shoulders and down each side. 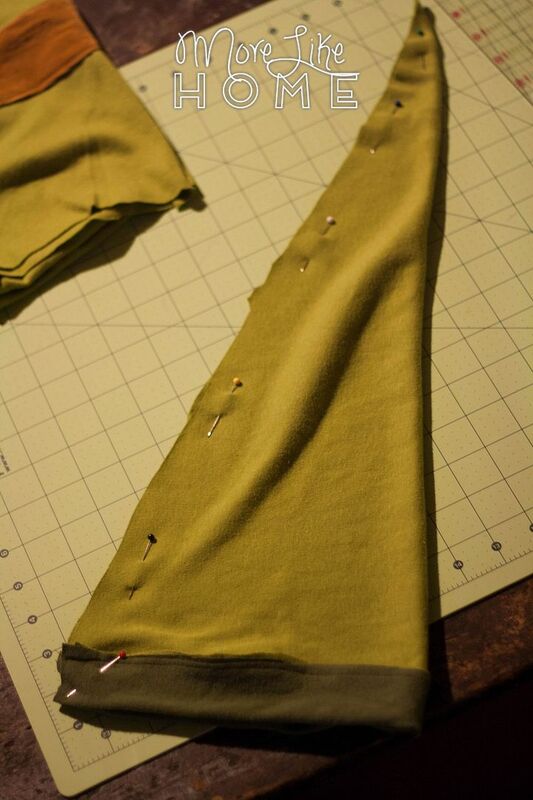 Sew along the sides (not the arm openings) and across each shoulder (not the neck opening) with a 1/2" seam allowance. Next I worked on the hat. I drew a triangle that was 19" wide across the bottom (you can make this larger or smaller to fit the head, this one still has wiggle room for my large-headed 5-year-old), and 22" long up to the point. Fold the strip in half lengthwise (with wrong sides together) and lay it along the bottom edge of the hat so the raw edges line up (the hat should be right-side-up if it has a right side). Pin it in place. 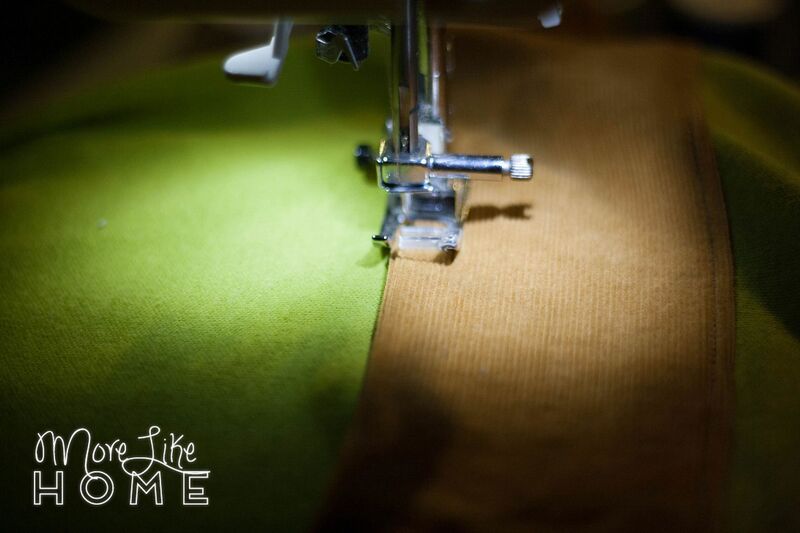 Sew right along the bottom edge with a 1/8" seam allowance. 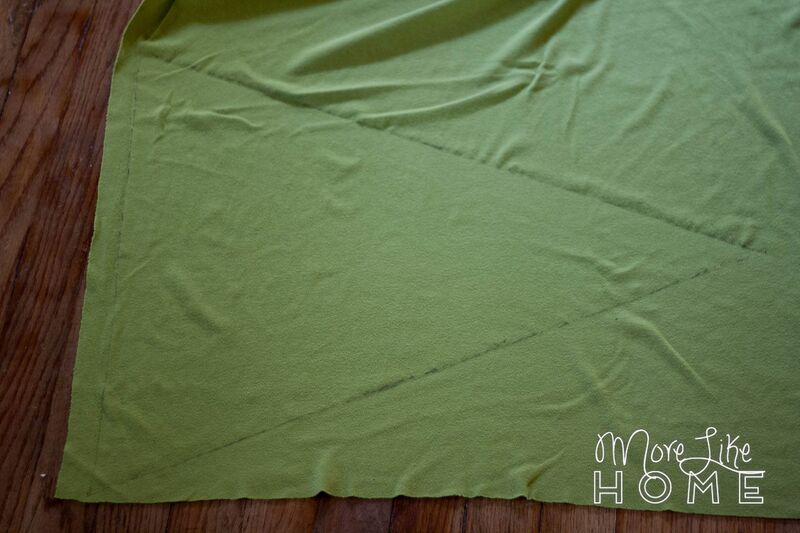 Fold the green strip down at the seam (you can press along the seam to help it stay put) then fold the whole hat in half with right sides together and pin along the raw edge. 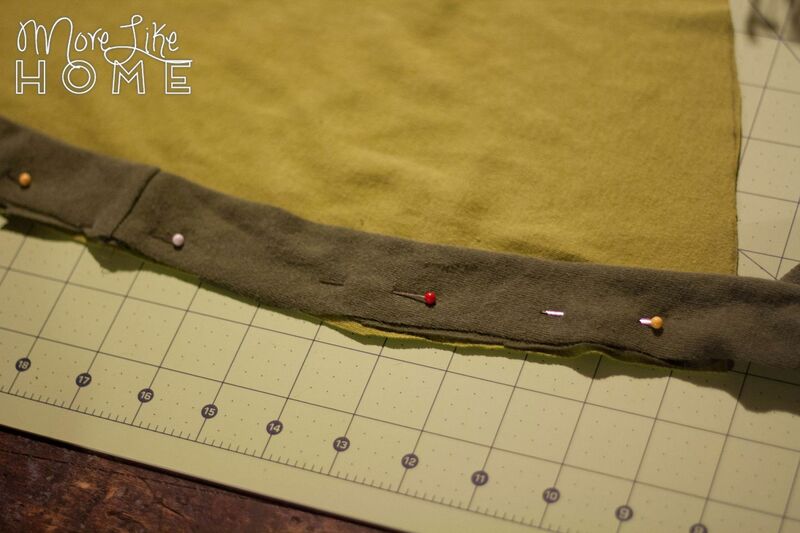 Sew along the edge with a 1/2" seam allowance (keep going all the way to the bottom of the dark green strip!). 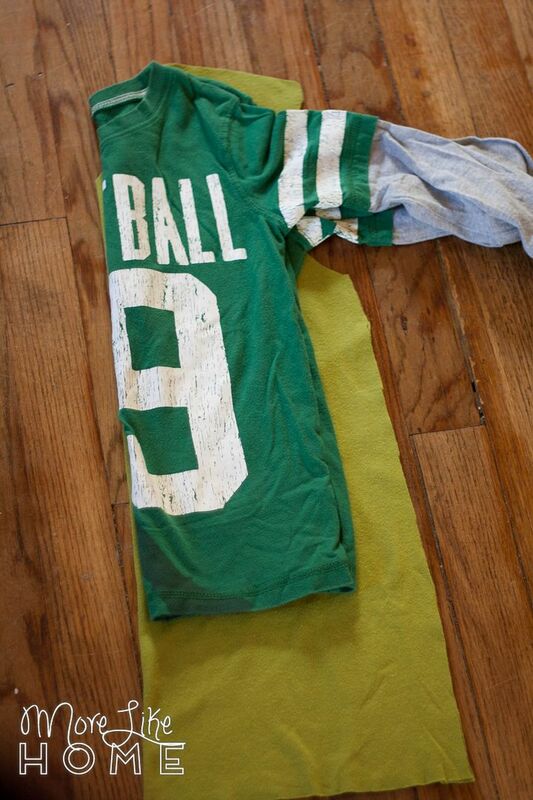 Cut any extra tail from the green strip. 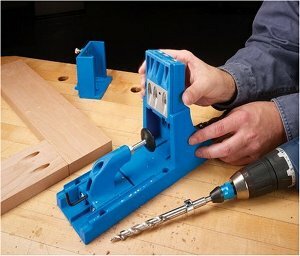 Flip it all right-side-out and you're done! 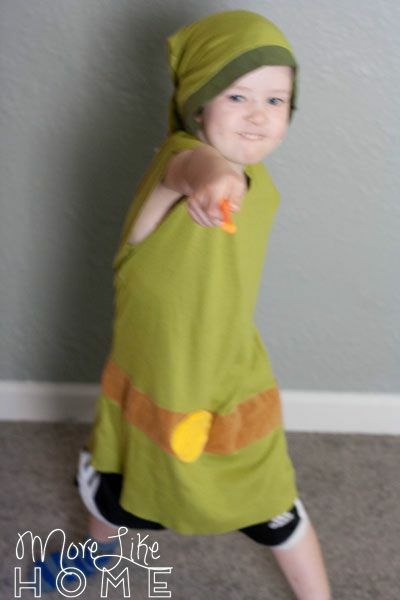 Toon Link in the house! 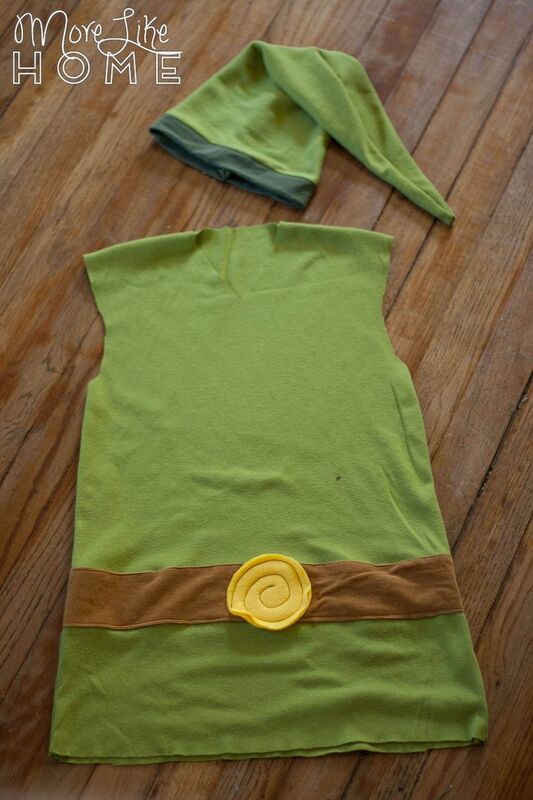 The basic tunic pattern is a great starting point for all kinds of other costumes, too! These are my only action shots because he can't. stand. still. when he's wearing it. Because those bad guys aren't gonna fight themselves. Obvs. Anyone else making costumes? 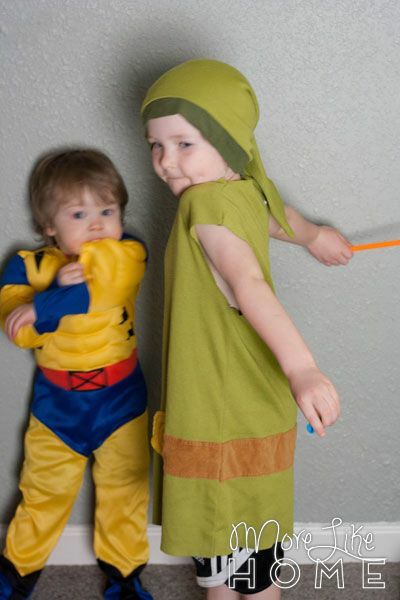 What costume would your kids go crazy for?